The Unlikely Pilgrimage of Harold Fry is a fiction story about friendship, regret, loss, healing, and forgiveness. Newly retired Harold Fry can’t figure out what to do with himself, spending his days aimlessly, and enduring his wife Maureen’s constant nagging and irritation with him. One day, a letter arrives for Harold from Queenie Hennessy, a former coworker whom Harold hasn’t seen in twenty years. Queenie’s letter is a farewell—she has cancer and is dying. Harold, suddenly inspired by this letter, impulsively begins to walk to Queenie’s hospice—600 miles away—with the idea that his walking will keep her alive. There were parts of Harold Fry that I really loved—beautifully heartrending scenes and lyrical language. The reflections of life, loss, and love, and the transformations of the characters from start to finish were lovely. However, there were other parts of the story that were just “meh” for me—transitionary chapters that were either meandering or stagnant—and I found my mind wandering. Although, not long after my mind would be losing interest, some cheeky, quirky thing that happens to Harold would spring up out of nowhere and capture my full attention again. It’s weird because I felt like this was a light read, but the final message is more profound, and there is a ton more to these characters than initially meets the eye. The story’s vibe sort of reminded me of the movies Waking Ned Divine and Saving Grace. Come to think of it, Harold Fry would make an excellent dramedy film! I loved the ending, and the overall messages of hope, faith, and “it’s never too late” stay with you, as does the quirky humor. Harold is an endearingly sympathetic, flawed character. 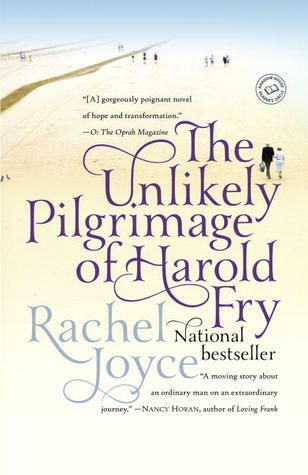 The Unlikely Pilgrimage of Harold Fry would be a great, quick summer read. Read from May 23 to 27, 2013. This entry was posted in books and tagged contemporary literature, drama, family, fiction, travel by kristin @ my little heart melodies. Bookmark the permalink.